"pushing my limits" bow buildalong - Cosmetic suggestions? Re: "pushing my limits" bow buildalong - Cosmetic suggestions? Very cool. I really like the grip design. Thanks ROH and Luke. I shot 'er in yesterday, put 50-60 arrows through it. I have one arrow that will shoot cleanly off my hand... all the other ones hit the riser with a bang. When I shoot the good one it's so smooth and quiet. I'm so excited.. I feel like if it was going to catastrophically blow up, it would have done so already. I hope. Now I have a few cosmetic decisions to make. I haven't made it this far with my past bows, they were either a pain to shoot or they blew up. I'm thinking of snake skin over the sinew, unless anybody else has a unique suggestion (I love unique ). I don't know what species to go with, the limb is only 1-1/4 at the widest and the base of the curves is 5/8. It's 28" from handle center to upper curve and 27" from handle center to lower curve. 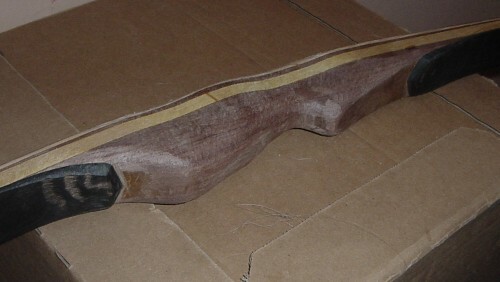 Is it possible to put leather on a handle shape like this, or will it end up sliding around too much? I'm going to put the rest right under my hand, as if I were shooting across my finger. I started getting some hand shock if I moved the arrow up. I'm kinda tempted to weaken one of the limbs and see if I can't get rid of handshock completely. I can't remember which limb needs weakening to move the sweet spot up, but I remember reading a thread somewhere about it. "The most insidious influence on the young is not violence, drugs, tobacco, drink or sexual perversion, but our pursuit of the trivial and our tolerance of the third rate." As far as grip, yes you can put a leather grip on that bow easily. You will have to get the leather to stretch but it will work. What are you going to make the rest out of? Sweet looking bow by the way! The leather handle will be wrapped over top of the rest so I guess it doesn't really matter what it is made of. I've got more walnut laying around or I could do the leather and superglue thing. No snakes up here hehe. I was looking at what pinehollow has. If I buy a snake skin I'm definately going to be making el cheapo cane arrows. I wonder if there are any native fish species up here that look cool. I'll post in the classifieds for fish or snake and see if there are any to buy/trade.